Where oh where has the summer gone??? 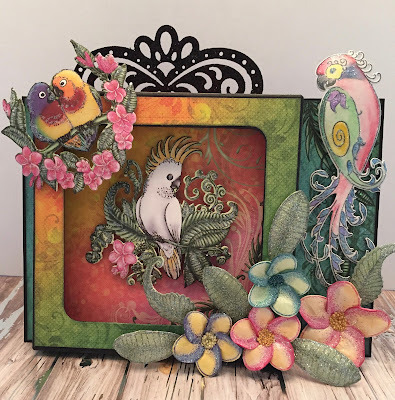 I guess time flies when you're having fun and I'm having so much fun with the new Card Shadow Box Sets from Heartfelt Creations. It so easy to create a beautiful card with them. 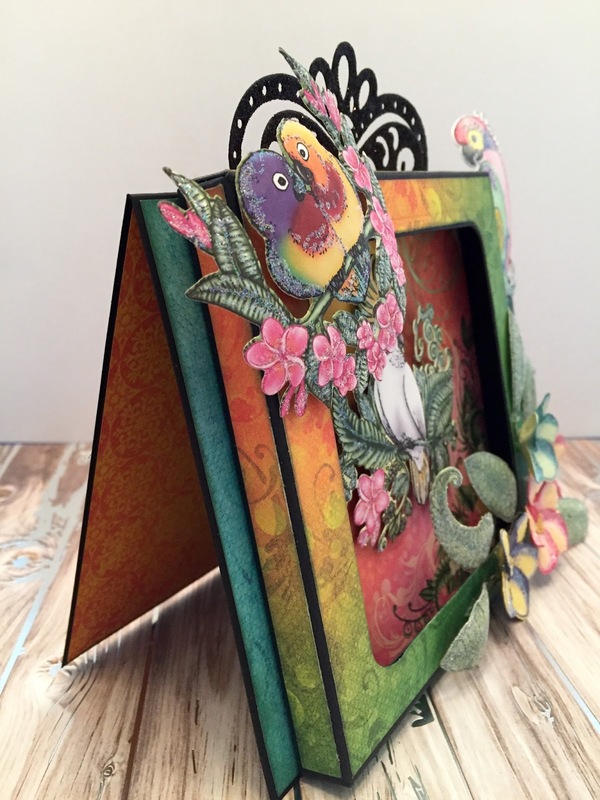 Here's one that I made using the fabulous and colorful Tropical Paradise Collection. Enjoy! Other Products: Memento Dye Ink Pad Dandelion, ColorBox Chalk Ink Pad Mint, Zig Clean Color Real Brush Markers, Kuratake Water Brush, Sparkle Shimmer Spritz, Hot Glue Gun, White Pearl Metallic Cardstock, dimensionals. Instructions: Create a 5” x 7” black card base. Cut designer paper from the paper pad 4 7/8” x 6 7/8”, ink the edges and adhere to card front. Cut paper from the paper pad 4 7/8” x 4 7/8” to cover the front of the 5” x 5” shadowbox. Cut out the center using the Cut Mat Create 2B die. Cut strips of the same paper to cover the top, sides and bottom of the box. Cut another piece of designer paper 4 7/8” x 4 7/8” for the inside of the box. Ink the edges and adhere all of the pieces of designer paper to the shadow box. Cut the Ornate Border from black cardstock and adhere to the back of the box as shown. Adhere the shadow box to the card base. Stamp the parrot with Memento Tuxedo Black ink, color with Zig Clean Color Real Brush Markers, cut out with coordinating die, shape and adhere to the card using dimensionals. Stamp the plumeria flowers with various ink colors, color, cut and shape. Stamp the leaves with ColorBox Mint Chalk Ink and color with Memento Bamboo Leaves, cut and shape. Spray the flowers and leaves with Sparkle Shimmer Spritz, add Prills to the flower centers, add glitter and adhere to the card. Cut the Cockatoo and the love birds from the paper pad using coordinating dies. Shape, glitter and adhere them to the card as shown. I thank you for stopping by and I would so appreciate it if you would leave a comment. I do love reading them! Be sure to stop by next week for the debut of the Beary Fun Retreat Collection...you're going to love it! Gorgeous, your flowers and perfect!! Thank you Olga! I really appreciate your kind words! Awwww...thank you so much Susan! You just made my day! So beautiful Janet! I love those tropical colors!